A few weeks ago, I made this kickass vegan version of wedding soup, inspired by the folks at Thug Kitchen. Sometimes when I'm trying out a completely new take on something, I try to keep a cap on getting too worked up about it, just in case it doesn't come out the way I imagined it would. In this case, this approach was 100% not necessary: the soup was awesome. So I thought to myself, there has to be other recipes I can use to incorporate my own version of the soup's white bean balls. Why not? After all, they're meant to replace the meatballs in the traditional soup recipe, so what else can I use them for? 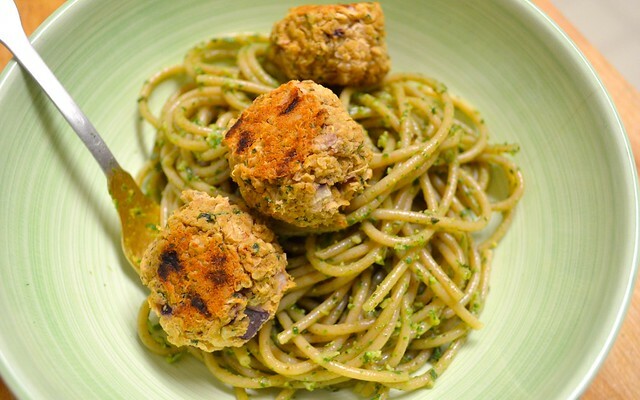 What other dishes typically call for meatballs? Duh, spaghetti. Big piles of warm, al dente pasta with, yes, some white bean balls with a little spin all my own. Preheat your oven to 400 degrees. Prep one large baking sheet with nonstick cooking spray and set aside. In a large bowl, mash up your beans until they become pasty. You can used the back of a fork to get this started, but feel free to use your hands if it seems easier. Add in your chopped onion, quinoa, garlic, nutritional yeast, olive oil, soy sauce, seasonings and parsley. Mix it all up (again, hands work) and get everything evenly distributed. If it feels a little dry or the mixture isn't sticking together, add a touch more olive oil. 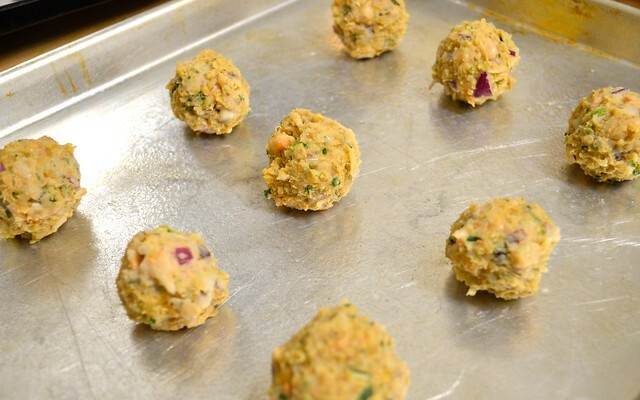 Form your paste into balls (about golfball-sized) and place them on your prepared baking sheet. Bake them for about 30 minutes, turning them over halfway through, until they're golden and slightly crispy on the outside. 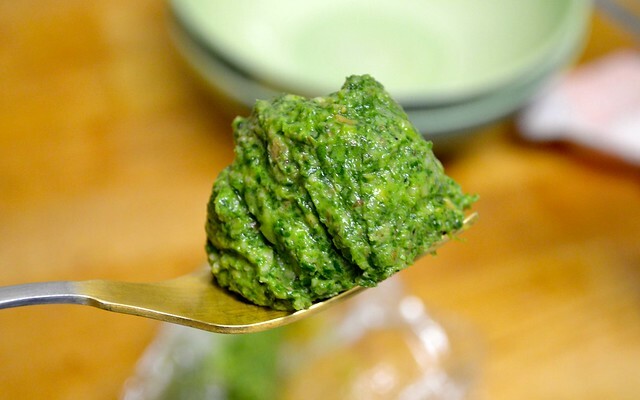 Meanwhile, you can get started on your pesto. I like to make an extra large batch each time so I can freeze meal-sized portions for nights when I'm feeling stuck on what to make. Leave on the countertop for an hour or more and boom, instant flavor. In the bowl of a large food processor, pulse together your almonds, garlic, salt and pepper, about 10 pulses. Add your arugula and continue pulsing until finely chopped, but not puréed. Add your olive oil and pulse 2-3 more times, until evenly distributed. Set aside. Get a large pot of salted water boil on high heat. Prepare your pasta according to the package instructions. 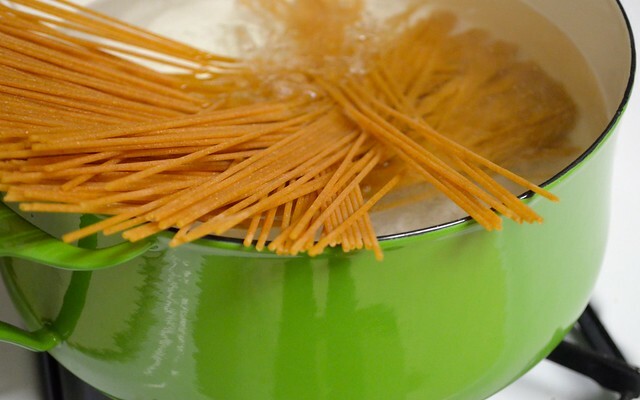 Once al dente (about 9 minutes for our whole wheat spaghetti), reserve about 1/4 cup of your cooking water. Drain your pasta and return to your pot. 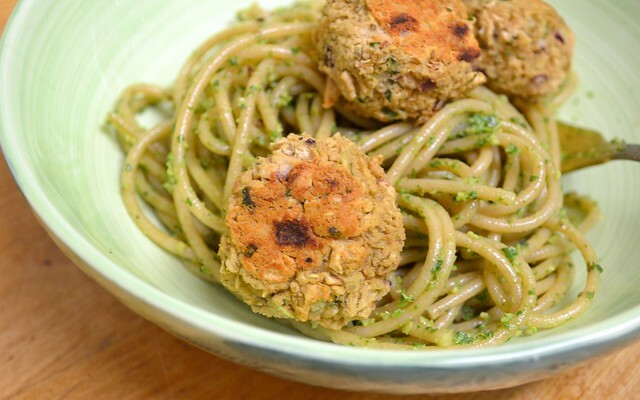 Immediately toss together with your pesto until evenly coated. If the pasta is sticking together at all (it shouldn't if you move quickly), use a bit of your reserved water to loosen and separate. 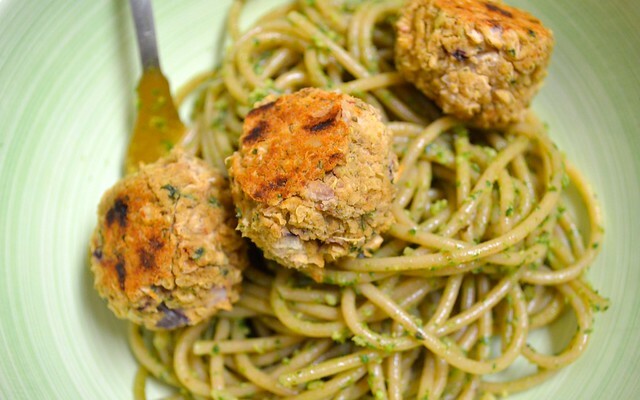 Serve immediately, topping each bowlful with white bean quinoa balls. It will change your life, always for the better. So you say you want to pesto? Here's a kale version (with dinosaur-shaped pasta to boot). For the adventurous ones, an everything bagel pasta primavera. And vegan mac & cheese. Can it be? Really? It can. Sort of.